I have a much larger project related to this in the works but I just wanted to quickly show you a little tidbit. Using a HDMI to SDI Mini Converter from either Blackmagic Designs or AJA Video, you can send a quality video signal to your SDI based video engineering equipment such as Waveform / Vectorscope from Leader. I've used both and I think that they're pretty much the same. 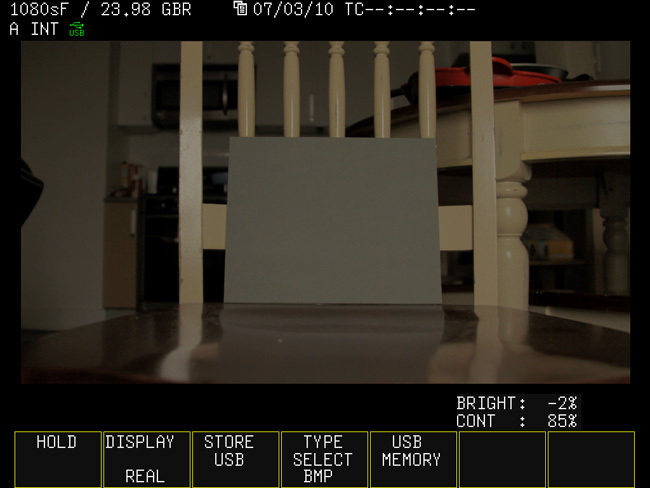 Abel's version that's powered with Canon batteries uses the Blackmagic version I believe. For these little tests, I used the AJA. From the 7D, using the proprietary mini HDMI to full size, I hit the mini converter, from there I sent 1080 60i video from the box to my scope via SDI. This is a frame capture from the live video raster. For ease of illustration, the scene is a simple Kodak Gray Card in my living room. The raster captures from the Leader are always a little darker and a little warmer than what you see on the actual video. As you well know, there's no way to output clean, display free video from Canon SLR cameras. Let's hope they fix this in the near future. 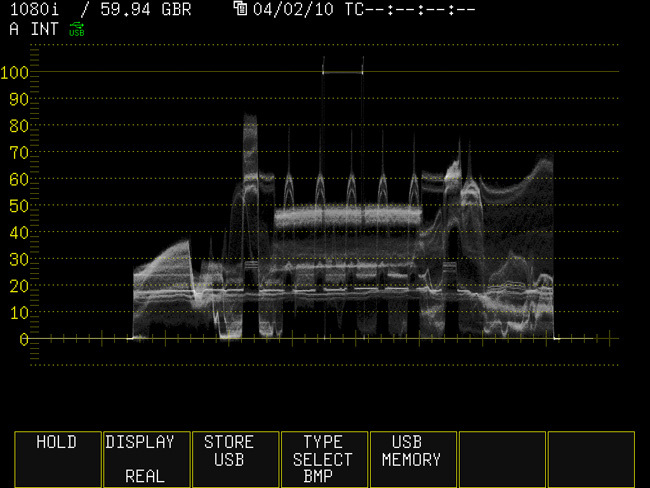 This is the waveform of the scene. The semi-opaque 16:9 matting and the white center marker are outlined with in red below. That is not part of the raster that's being recorded to card so if you use this method, you need to know what to look for on the waveform so that you can disregard it. 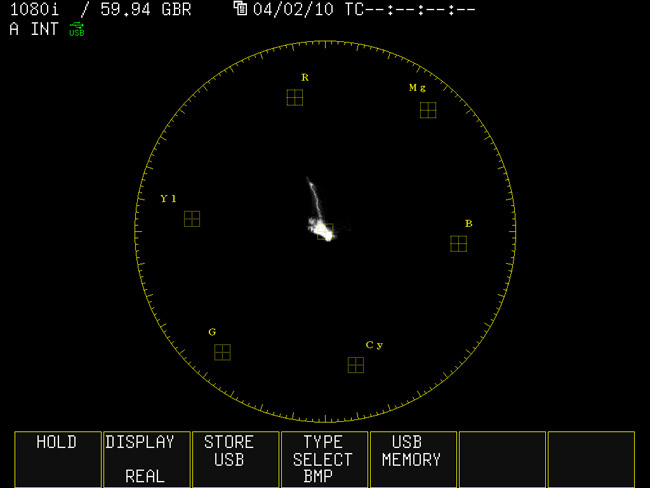 Here is the scene on the vectorscope. Though the screen captures always look a little warm, we know our white balance is set correctly because our picture information is centered on the scope. Now let's have a look at the actual raster that was recorded to the CF card. Interesting eh? The codec seems to be compressing it a bit compared to the live video. It's very close though and if anything, it's better that your files are a little clamped down from the monitor rather than expanded. These cameras pretty much shoot WYSIWYG and with their reduced latitude and thin codec, all the more reason to use the right tools in my opinion. That is if you have access to them. If not, I've found that if I depress the shutter a little bit while shooting vid and call up the camera's built in light meter, that setting it right in the middle like you're supposed to results in pretty nice looking video. Pretty convenient actually.. Less stuff to carry and the results are just as good. Nice when that works out. There are plenty of situations where you're going to want a proper monitoring setup but for the average run and gunner, I think the built in light meter gets the job done.